Welcome to our first collection of 2019. We’ve chosen some bars from some of our most popular makers to help you start the New Year in style. First we have a classic dark from Bonnat, one of France’s oldest makers. With more than 130 year of experience behind them Bonnat continue to innovate and to delight us with its incredible chocolate. A smooth dark chocolate with supremely buttery mouthfeel. As the rich bar melts, hints of berries and dried fruit come through. The sweet notes of red fruits are mixed in with more indulgent tones of caramel and fudge. Bonnat is one of France’s oldest and most respected chocolate makers. The family owned and run company has been crafting single-origin bars since the 1980s, making them an original pioneer of the bean-to-bar movement. More than 130 years after Bonnat was founded, the company is now run by Stephane Bonnat, the great-grandson of founder Felix Bonnat. Stephane takes a hands on role in crafting and sourcing cacao from over 35 farms worldwide. Next is a new bar from Austrian maker Zotter. This bar is particularly special and came about via a particularly close partnership between the Zotter family and the farmers. The results is a wonderful bar we hope you will enjoy. This bar has a sleek, silky texture which melts quickly, releasing waves of flavour. 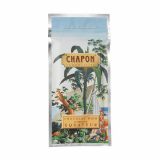 The chocolate has delicate dried fruity notes on the nose, which in flavour develops into chocolate bananas and caramel sauce, with a pure cocoa finish. Zotter chocolate is an Austrian chocolate company founded by Josef and Ulrike Zotter. The couple’s daughter, Julia Zotter, was instrumental to the creation of this bar. Julia spent a summer staying with a family of cacao farmers in Para Brazil. Working alongside the farmers, Julia learnt about cacao cultivation as well as the tips and tricks of cacao fermentation. Thanks to the knowledge the famer passed on to her, Zotter was able to craft this bar. Then from Ritual is yet another new creation. Mexico is growing some truly exciting beans and it is a joy to see how makers are using them. 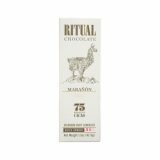 Ritual’s bar is a fantastic example of the country’s cacao. This dark chocolate achieves a delicate smoothness which is rich but doesn’t overwhelm. The initial profile is distinctly nutty, with a mix of hazelnuts and almonds coming through. Sharp hints of citrus balance out the wooded tones. Ritual bought these beans from the Rayen cooperative, a recent network of cacao growers in the southwest of Mexico’s Chiapas region: Soconusco. Rayen cooperative focus on quality and continuing the reputation of Soconusco as a region for growing fine flavour cacao. It partners with international chocolate makers and Mexican chocolatiers to boost their production and find new, direct buyers while conserving biodiversity in the cacao forests of Soconunsco. Finally from British maker Duffy Sheardown is a wonderful Nicaraguan bar. The beans, Chuno, are unique to the country and have been designated an ‘Heirloom Cacao’ owing to its unique flavour profile and genetics. A creamy milk bar with a gentle and soft mouthfeel. Delicate flavours meld with subtle sweetness in a smooth tasting experience. A complex mix of fresh hay, honeyed figs, and mellow red fruits gives way to a caramel finish. Duffy is an early supporter and promoter of the ‘Direct Trade’ movement, which goes well beyond Fairtrade standards. Duffy follows a ‘Direct Cacao’ model, in which chocolate makers agree to pay whatever price the farmer asks for his cacao beans – without complaining. Duffy has sourced his beans from Xoco who work with farmers in Honduras and Nicaragua. The Chuno bean strain for Duffy’s Oh Juno! grows south of the Lake Managua in Nicaragua. This collection can be bought as our Box Of The Month gift box for the special price of £24.95 while stocks last, until late February 2019. Welcome to our final box of 2018. We finish the year as we began it with some outstanding craft chocolate bars for you to taste and enjoy. The last twelve months have been an exciting time at Cocoa runners as we have expanded our library of chocolate makers and tasted even more bars from ever more diverse corners of the globe. And we ourselves have been travelling too; we’ve been introducing people to craft chocolate all over the UK, have had a blast organising Canopy Market and have even popped up on TV a couple of times. But we’re not stopping here. Already over the last few months we’ve been hard at work planning more events, more monthly boxes to ensure that 2019 proves an even more exciting year in craft chocolate. There’s still one final ingredient in all this and that is you, our loyal subscribers. Without your passion and enthusiasm Cocoa Runners would not be here. Thank you for your continuing support, we look forward to sharing more chocolate with you next year! This dark milk chocolate is creamy and mellow with a fragrant sweetness, offering up notes of tea leaves and freshly-baked biscuits. The Muscovado sugar used, naturally makes for a caramel and treacle-rich flavour profile. Mancunian chocolate maker Dormouse has crafted this chocolate using cacao sourced from Kablon Farms in South Cotabato, Philippines. Kablon Farms, alongside growing cacao, produce coconut sugar, and jams made from fruits of the trees that shade the cacao: coconut, mangosteen, guava, jackfruit, durian, passionfruit. The cacao beans that grow here are much smaller in size than the average bean, but they pack a lot of flavour. A sweet, spicy and creamy treat. This limited edition dark milk bar has been infused with aromatic nutmeg, giving a sweet yet rich flavour. The chocolate brings to mind gingerbread, honey cake and biscuits. 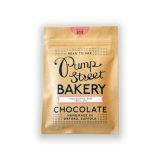 Pump Street is an English bakery and chocolate makers, set up by father and daughter team Chris and Joanna. Before starting Pump Street, Chris was engineer at IBM with a number of patents to his name. His insatiable desire to invent and innovate lead him first to the art of sourdough bread and then to craft chocolate. His obsession with perfection took him all the way to the cacao farm to ascertain the farmers are fairly compensated. Two tasting bars of dark chocolate for you to compare. The Barba is bright and spicy with a touch of black pepper and a buttery finish. The Medagla is savoury and intense, and resonates with hints of mixed baked fruit. Danish chocolate maker Mikkel Friis Holm is passionate about the genetics of cacao. He has been committed to isolating the genetics of cacao since he first got involved in Nicaraguan cacao farms back in 2008. These two bars each have been made using one of the unique Nicaraguan varietals Friis Holm has helped to rediscover. The beans in each bar are incredible rare; Friis Holm estimates there are less than 100 trees growing either Barba or Megdala beans. 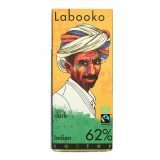 A pleasant and well-balanced acidity comes through in this dark bar and is softened by the chocolate’s buttery quality. Plums, damsons and forest fruit complement the classic red berry notes of Madagascan cacao. 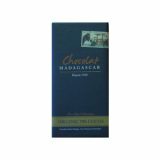 Chocolat Madagascar is one of only two craft chocolate factories in Madagascar. Whilst Madagascar is well known for the quality and flavour of its cacao, the vast majority of its beans are exported and crafted in Europe, the US and Asia. The Mava farm is located in North West Madagascar, nestling in the Sambirano valley and foothills of the Tsaratanana Massif, it offers unique terroir cacao. The farm is owned by the local Ramanandraibe and the Taloumis families. This collection can be bought as our Box Of The Month gift box for the special price of £24.95 while stocks last, until late January 2019. As we head into winter, we’ve four delicious craft chocolate bars to help keep you warm. First from expert second-generation chocolate maker François Pralus is an unusual bar which blends different cacao origins together. We invite you to taste what happens when two unique cacao harvests are expertly combined. A smooth and buttery dark chocolate with a gentle yet creamy melt. The bar has subtle smoked and roasted notes. As the smokiness fades, some interesting and unexpected notes of mushroom and pollen come through. Crafted in France, this bar uses a blend of cacaos from Ghana and Indonesia. Pralus has been making patisserie and baked treats in Roanne, France since 1948. Auguste Pralus quickly became famous for his Praluline, a stunning brioche with pieces of bright red almonds and hazelnuts coated in rose sugar. Today, Auguste’s son François is at the helm, and while the Praluline is still popular, Pralus is now as well known for its chocolate. Next is another bar crafted in France by a much younger company, Ara. Ara is French for ‘macaw’, and founders Sabrina and Andres are as dedicated to protecting the environment as crafting incredible chocolate. This Peruvian dark chocolate is foremost jam-like, mixes the sweet flavours of strawberries, raspberries, and blackcurrants. The bar has a slightly roasted profile, with a fudgy texture and thick melt. Ara crafts its chocolate in France, with its founders Andres and Sabrina originally hailing from Venezuela. The simplicity and quality of Ara’s ingredients is the key to expressing the true flavour of the bean in each bar. Sabrina and Andres try to find organic cocoa growers in Central and South America, who grow their cocoa using sustainable farming techniques that don’t destroy local ecosystems. The city of Tingo Maria is on the Huallaga River in central Peru. Now we’re delighted to introduce Belmont Estate from Grenada. Belmont has been growing cacao for centuries, and more recently has worked with the Grenada Chocolate Factory. Inspired by the legacy of Mott Green, Belmont has now set up its own small factory. 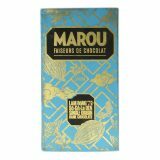 A dark milk chocolate with a flavour profile of caramel, vanilla fudge and lightly whipped meringue. This is a milk chocolate that sings pudding throughout, from its flavour to its fudgy texture. Belmont Estate is a cacao plantation that dates all the way back to the 17th century, and the cacao today still receives ancestral traditions in the harvesting, fermentation, drying of its chocolate. In 2017 Belmont built a small chocolate factory to start crafting its own bars after more than 200 years of growing cacao. The name Belmont is a hybridisation of the French for beautiful mountain “belle mont.” The bell on the packaging is a real bell on the estate and is 300 years old. Finally we welcome Brazilian cacao grower and chocolate maker Mestiço. The family farm, Fazenda Bonança has been growing cacao for over 40 years. The vision of the Mestiço farmers and chocolate makers is to focus on bean quality not quantity. The chocolate is very pale in appearance, and the texture is very creamy and smooth. The opens on notes of muscovado molasses and delicate spice. The powerful caramel sweetness gives the impression of a dark milk chocolate. Brazilian tree-to-bar chocolate maker Mestiço has been growing cacao for over 40 years at Fazenda Bonança, in Itacaré, Bahia. Mestiço plant and graft productive and resistant strains of cacao. The Bonanca “14 Varietal” is a Trinitario strain of cacao, named after the farm where it had grown. The name “Mestiço”means “mixed race”. It is a reference of both the Trinitarios that grow on the farm and of the mixed heritage of the chocolate maker: Japanese and Brazilian. This collection is featured as our Box Of The Month for the special price of £24.95 while stocks last until late December 2018. This month we’ve four incredible bars from makers worldwide, each using a very special cacao from a different terroir. First from Marana is a bar using beans from the Piura Region of Peru. The wonderful cacao farmers in the region produce beans with a vibrant and fruity flavour profile, which Marana has brought out wonderfully. This fudgy milk bar has a soft and crumbly texture whilst maintaining a distinct creaminess throughout. A gentle sweetness and a creamy milk flavour blends in with subtle hints of violet, rose and orange blossom. Showcasing some of Peru’s best beans is the principle goal for Marana. It wants to do this by fostering close relationships with the farmers and supporting them to grown the finest Peruvian cacao. Through its distinctive packaging, Marana has sought to represent the cultural identity and heritage of their nation. The bars within the Piura collection are inspired by renowned Peruvian painter, Pancho Fierro and created by a local Peruvian artist in watercolours. Next we skip over to Italy, where Ruket has crafted this limited edition bar from a single crop of Vietnamese cacao from Lam Dong Province. The cool, lush forests of Vietnam’s Central Highlands lend the cacao its distinctive profile. Rich flavours of raisins and prunes balance sweetness and tannins. The smooth bar also has a distinctive creamy flavour that mixes with wild honey. The finish is dominated by honey and a touch of mixed spice. Ruket is an Italian craft chocolate maker in Sant’Agostino. The founders Alessandro and Marco have always loved food and been fascinated by traditional, artisanal production. Marco wanted to find the very best chocolate for his ice cream parlour, and he asked Alessandro to help him, from this Ruket was born. For this limited edition bar, they have got hold of a limited supply of Vietnamese cacao from Lam Dong Province. Now from New Zealand maker Hogarth we’ve a bar using Bertil Akesson’s Madagascan cacao. There are a highly sought after bean, and we loved tasting Hogarth’s interpretation of this bean. The dark chocolate melts with a slightly fudgy, almost grainy texture. The bar’s fruity profile has little red berry but plenty of zesty citrus fruits. A drying but chocolatey note counteracts the acidity, creating a very well-balanced bar. Finally all the way from Indonesia we have a new bar. Krakakoa has worked with cacao farmers in South Sumatra to create this bar. The hot and humid tropical rainforests and the rich system of rivers create a unique bean. This aromatic dark chocolate exudes a vibrant flavour profile, one that reflects the cacao’s distinctive and unique origin. Expect flavours that range from spicy to fruity, with cranberry, forest honey, and ginger. Krakakoa’s name took inspiration from the volcano “Krakatoa” to reflect the chocolate as being proudly Indonesian. For this particular bar, founders Sabrina and Simon worked with cacao farmers in the Sedayu village on the wild land of South Sumatra. Sumatra was one of the first islands to grow cacao in Indonesia. Home to animal filled jungles, nutrient-rich soils and rainforests, and peacefully deserted beaches; it’s a juxtaposed island that nourishes and nurtures. This collection is featured as our Box Of The Month for the special price of £24.95 while stocks last until late November 2018. This month we welcome our first maker from Estonia, Chocokoo. Founder Kristel Lankots was a board member working at a road construction company, when in 2015 she decided to do something she was truly passionate about. A supremely smooth and buttery texture marks out this dark bar. Honey drenched fruit are balanced by light acidity. Hints of sun-ripened apricots blend into sweet lemon to create a gently tangy finish. Wrapped in paper designed with Nordic mittens in mind, Chocokoo is Estonia’s first bean to bar chocolate maker. Founder Kristel Lankots wanted to do something new that she really loved, which she could truly call her own. Equipped with a degree in economics and business management, Kristel founded Chocokoo with the aspiration to create something tangible from her hard work. For this bar Kristel has sourced her cacao from farmers in the Upala region of norther Costa Rica. Next we’ve a wonderful dark chocolate bar from Dandelion. Dandelion has sourced its beans from Maya Mountain in Belize. Beginning in 2010, Maya Mountain was a pioneer of the bean-to-bar revolution. The organisation (part of what is now Uncommon Cacao) is dedicated to providing market access for smallholder cacao farmers. The bar’s distinctive texture is not quite smooth, but melts nicely on the tongue. The bar has a fresh profile with mixed fruit notes. Sharp cherries and green grapes come through, along with a tangy hint of pineapple on the finish. Next, another new maker, this time from Brazil. Luiza and Diego of Amma have been growing and selling the finest Brazilian cacao to makers worldwide (including Pralus) for almost two decades so we are delighted to share their own interpretation of their beans. 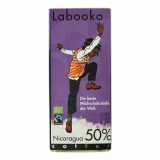 This dark chocolate is generously sprinkled with pieces of roasted cacao nib, creating a satisfyingly crunchy texture. Sour yet sweet, hints of Morello cherry lead into light aromas of jasmine and honeysuckle. Amma’s story begins in 2002, with Luiza and Diego returning to traditional cacao growing family farms in the South of Bahia, Brazil. They wanted to promote organic cacao in these areas, which would in turn ensure the preservation of the forest and the livelihood of the families of rural workers in the region. After a few years of selling their beans to some of the world’s best chocolate makers, in 2007 the pair teamed up with Frederick Schilling to make their own bars. Finally we’ve a wonderful new bar from our friends at Georgia Ramon. Ever experimenting and refining their techniques, they have used rare Guatemalan cacao and have chosen not to conche the bar, giving it a unique texture. A dark milk bar with an intentionally grainy texture. As it melts, deep, warming flavours burst forth. Gentle spiced hints of cardamom mix with malt to create a sweet flavour reminiscent of a winter cookie. Georgia Ramon is a great believer in the importance of transparency. Founders Georg and Ramona disclose details of the roast, conche and grind times on each of their bars. The cacao for this bar has undergone a medium roast, followed by a 72hr grind. It has not been conched, resulting in the unusual texture. This transparency extends to their cacao sourcing. The Guatemalan beans in this bar were sourced from the Cooperative Fedecovera Q’Eqchi Mayas farmers. This collection is featured as our Box Of The Month for the special price of £24.95 while stocks last until late October 2018. This month we bring you a collection that brings together some of the finest bars from European and American makers. Anyone who follows craft chocolate closely will know that the US chocolate revolution has charged forward rapidly in the last few years, leaving us Europe (and the rest of the world) running to keep up. To put this in perspective: the last few years the UK chocolate movement has grown from less than 5 to close to 20 ‘bean to bar’ makers. In the States, they have gone from about 20 craft chocolate makers to a couple of years ago to several hundred today. In this month’s box we bring you bars from US makers at both ends of the revolution: the already well-established (and respected) Ritual, and exciting new-comer Undone. The bar is pale in colour, thanks to the high percentage of white beans. The delicate bar dances between fruity and floral. Sharp cherries with a hint of citrus sweeten into a spicy, aromatic finish. 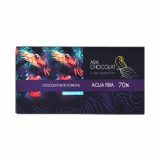 The chocolate has a gently buttery texture, giving a smooth melt without becoming cloying. Staying in the States, we now travel to Washington DC and welcome our second new maker, Undone. Adam Kavalier, who founded Undone with his wife in 2014, was originally a phytochemist. While researching flavonoids he slowly found himself being drawn to a particular source of flavonoids: chocolate. This particular bar is made using rare Bolivian beans that grow wild in the rainforest. Indulgent notes of sweet cocoa lead to earthy coffee. We detected a hint of fruit mixed in to the smooth chocolate. The astringency builds towards a slightly drying sherbet finish. A complex bar, on each tasting different flavour revealed themselves. Next we come to the Netherlands and our second very different Peruvian bar. Chocolate makers Enver Loke and Rodney Nikkels have sourced beans from the Peruvian Amazon. The bar is named for the indigenous peoples, the Awajun, who live in the rainforest and harvest the cacao and are also represented on the front of the bar. We found this to be a far more intense experience than Ritual’s Peruvian bar. The rich flavour is immediately apparent from the bar’s chocolatey aroma, laced with a hint of bitterness. As with Chocolate Maker’s other bars, the texture is seriously smooth and buttery. There is a green, slightly earthy dimension that reminds a little of unripe banana and fresh coconut. Finally we have two brand new bars that bring together the snowy peaks of Iceland and the sun-drenched valleys of Tanzania. 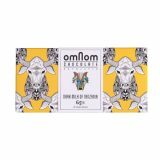 The eternally stylish Omnom has crafted its latest chocolate using Simran Bindra’s (of Kokoa Kamili) beans from the Kilombero Valley. Look out for Omnom’s new custom mould which completes its perfectly designed chocolate. At 65%, this is very much a dark milk chocolate. The high cocoa content gives the bar a richness, while the addition of milk creates a thick and indulgent texture. As you take a bite, the chocolate melts softly, almost like a piece of fudge, and filling your mouth with flavour. Omnom describes its bars as tasting like ‘a brownie’. We agree that there is something deeply chocolatey about the bar. A distinctive note of muscovado adds another layer of decadent flavour. 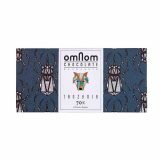 Omnom’s darkest chocolate to date, the well-tempered bar is smooth with a quick melt. The bar is rich and fruity with layers of damsons, apricots and ripe plums. A darker, roasted note hints of creamy hazelnuts and adds intensity. This month’s box is the result of long and careful planning. We have two new makers to introduce you to. We’ve been working with for many months and we are delighted to finally give you a taste of these bars. 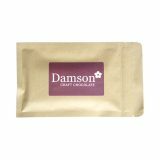 First and foremost we are ecstatic to bring you a bar from Islington’s own craft chocolate maker Damson. As a lifelong chocolate lover, prolific chocoblogger and Cocoa Runners founding team member, there only was one chocolate topped mountain left for Dom Ramsey – to start making his own bars. And boy was Damson (his brand) worth the wait. Dom’s factory is a just a stone’s throw from our office, up in Angel. If you are ever passing by, make sure you pop to say hello and stock up on his bars. Here you can also see (and buy from) one of Cocoa Runners’ Craft Chocolate Galleries. 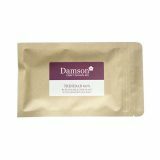 Damson has combined some really special ingredients in these bars. Cocoa from Trinidad comes together with Halen Môn sea salt from Angelsey and buffalo milk from Laverstoke Park Farm. The rich milk gives the chocolate a creamy texture and unusual taste. The beans have a slightly green but floral note that gives the bar a herbal undertone with a hint of vanilla. The the bar’s sweetness is balanced by the sea salt that give an edge and brings out the grassy flavours in the beans. Damson has used Brazilian beans from the Fazenda Camboa farm in Bahia. Owned and run by two brothers, it is the largest organic cacao farm in Bahia, Brazil. The smooth dark has a deeply fruity profile, bursting with prunes, raisins and dark fruits. Strong roasted flavours develop, moving towards a creamy but slightly savoury finish. We found this to be an intriguing and many-layered dark chocolate. Now going to the other side of the world we’ve the epitome of a smokey bar, our first made with cacao from the Solomon Isles and crafted in New Zealand by Solomons Gold. We first met with Clive over a year ago when he let us taste some early prototypes – and for the last year we’ve been waiting to share the fruits of his team’s work. This the first bar we’ve brought over from a Kiwi maker (watch this space for more). Not only this, but it’s also the first bar in our Library using beans from the Solomon Isles. This is a seriously smokey-tasting dark chocolate bar. The initial aroma of wood smoke gives way to wooded hints of tobacco, rough leather and saddle soap. The strong flavours give the bar an almost savoury profile. The bar is not bitter or harsh, but the strong flavours give the chocolate an intensity comparable to a much higher percentage dark bar. 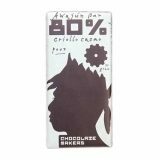 A really unique bar, its distinctive taste is divisive but still a must try for any adventurous craft chocolate aficionado. We’ve also been waiting to bring you this “better than Fairtrade” organic bar from Chocolat Madagascar. Over 70% of the world’s cacao is grown in Africa, but little is made there. Neil Kelsall and Chocolate Madagascar for the last decade or more have been seeking to redress this by growing the cacao and crafting their bars locally. 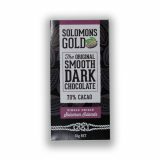 This smooth dark chocolate is simply wrapped but bursting with subtle flavours. The bar has a slightly peppery aroma, however once tasted, the flavour develops into hints of forest fruits and raisins. Alongside this, we detected a mild spice and flavour notes of balsamic vinegar. Compare it to their classic dark chocolate and taste the difference that different agricultural practices can have. Finally we’re delighted to bring you the latest bar from Sabrina and Andres of Ara, their Agua Fina bar, sourced with beans from Puerto Cabello in their home country of Venezuela. Ara means Macaw in French, and the couple are dedicated to protecting this rare bird with the help of their chocolate! This Venezuelan is particularly smooth, and sweet for a dark chocolate bar. The chocolate has an almost floral aroma, and the initial flavour notes we put as somewhere between lemon curd and salted caramel – a truly indulgent treat. Despite this initial hit of sweetness, the bar has a slightly smoky and astringent finish, with hints of coffee.